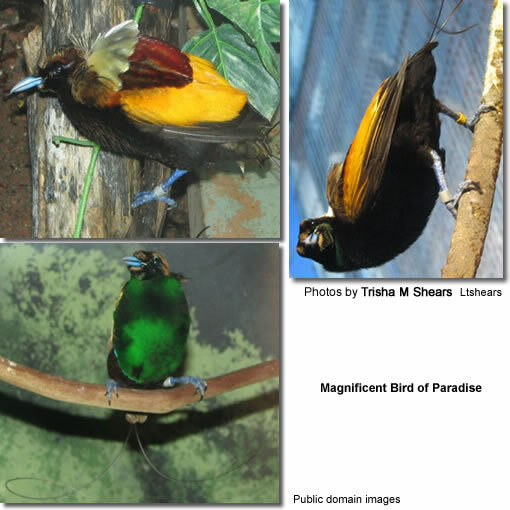 The Magnificent Bird of Paradise, Cicinnurus magnificus, is distributed amongst the hill and mid-mountain forests of New Guinea and surrounding islands. A widespread and common species throughout its large range, the Magnificent Bird of Paradise is evaluated as Least Concern on the IUCN Red List of Threatened Species. It is listed on Appendix II of CITES. 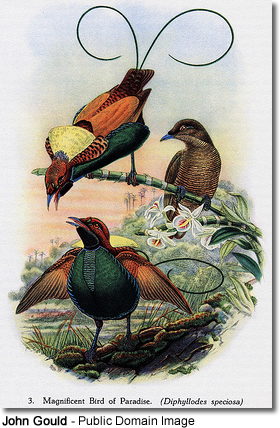 This is is a small, up to 26cm-long, bird of paradise with extremely complex plumage. The male has seemingly incandescent yellow wings, an iridescent-green breast shield, blue feet, and is adorned with a yellow mantle on its neck. It has two long, curved, blue-green sickle-like tail feathers. The female is a comparatively drab olive-brown bird with black-barred buffy underparts. Its diet consists mainly of fruits. The female lays two creamy yellow eggs.elaborate courtship display.